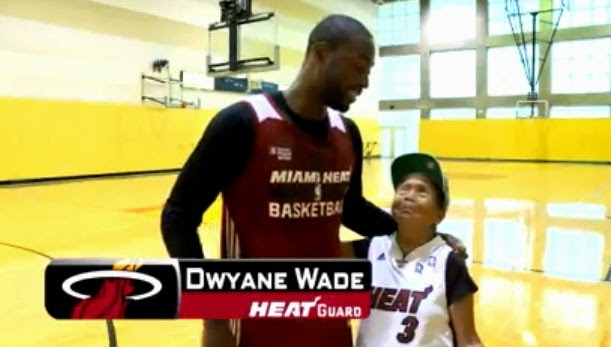 Wish granted for the 90-year-old Filipina fan after playing one-on-one basketball with NBA star Dwyane Wade. The Miami Heat star was sincere when accommodating Grandma Nelly's dream game. The 32-year-old former NBA MVP and the point and shooting guard of Miami gave the unforgettable basketball game experience to her Filipina fan as a birthday gift. Because on October 9, 2014, Grandma Nelly Magtoto posted a challenged video on micro-blogging networking site while saying "Dwyane Wade, on my 90 birthday, I want a play one on one with you." So Dwyane Wade accepted the challenge with gratefulness in his heart, and he was very thankful in that moment, because the one-on-one game with Grandma Nelly Magtoto was truly different from other basketball game. The uploaded video on Youtube has gone viral and already have more than 255,000 views since it was posted on October 21, 2014 to official Miami HEAT account. For more information about wish granted story, kindly save the given link and share to your joined social networking sites. Comments or suggestions about "WATCH: 90-year-old Filipina Wish Granted by NBA Star Dwyane Wade" is important to us, you may share it by using the comment box below.